Stop me if you’ve heard this one before. The Edmonton Oilers will actively participate in an NHL draft lottery. Shocking, I know. But in reality, nobody is really that surprised the Oilers are in this place. What is more stunning is where they might finish in the standings. By points, the Oilers are in 29th place, just two points ahead of Toronto. But by points percentage, the Oilers are dead last in the league, thanks to playing four more games than the Leafs. Even with the next generational talent on the roster, the Oilers occupy the basement in the NHL. With just six games left in their season, they are now the favorites to land that “coveted” 30th place finish. Look at the bright side. The worst they would pick is fourth. Look if the Leafs basically ice their AHL team with like five other dudes and can't finish last then maybe the Oilers deserve it. Why Are The Oilers Favored To Finish Last? Since the beginning of January, the Oilers have a record of 14-19-4, including 6-6-0 in March. They’re losing more than they’re winning, even with a healthy (but still young) Connor McDavid playing. It’s not that they’re trying to tank. With the Oilers, this collection of players is just bad. Their offense has underachieved in massive proportions. Their defense can hardly stop an AHL team. Their goaltending can’t always stop the bleeding. This is a team that needs a massive overhaul. Leafs won tonight. Oilers are last again. Last again. 10 years. Please get some defence. I'm tired. The good news in this (if there is any) is that the Oilers have just six games left to play this season. Their next three games are very difficult. They play at San Jose, at Los Angeles, then host Anaheim. The three California teams most likely win those games. That leaves the last three games, which are Calgary, and two against Vancouver. The way the Maple Leafs have won games, combined with the games in hand, give the Oilers an upper-hand in the race for last. The Leafs do still control their own destiny in this. But hearing what the Leafs players and coaches have said, there’s nothing to suggest they’re out to lose out. The Leafs still have Buffalo, Columbus, Philadelphia, and New Jersey on their schedule. Those are winnable games, even for this Leafs team. Back to the Oilers though. Losing their next three games gives them the fast track to last place. They can still win one or two of their last six, and still end up in last. Even if they don’t, they will land somewhere in the top three. The numbers suggest 45% of the time, someone in the bottom three of the standings will win the top pick. At this point though, what good does winning do for them? They’re here for a reason. The team is bad. They have some really good pieces in place (McDavid, Draisaitl, Nurse, Hall, Davidson). But everyone else has not done the job they set out to do. Coaches and management are on record as saying how unhappy they are with the season. It’s not a matter of if changes will happen, but when, and to whom. Yes, the Edmonton Oilers, even if they don’t land the top pick, will still get a high pick and very good player in this June’s draft. Auston Matthews is in play. McDavid/Matthews on the same team is just simply not fair. If not Matthews, Patrik Laine, Jesse Puljujarvi, Matt Tkachuk, Jakob Chychrun, Olli Juolevi, and others are available to the Oilers. Unlike past drafts and situations, the Oilers are in better shape now than before. McDavid will only get better. 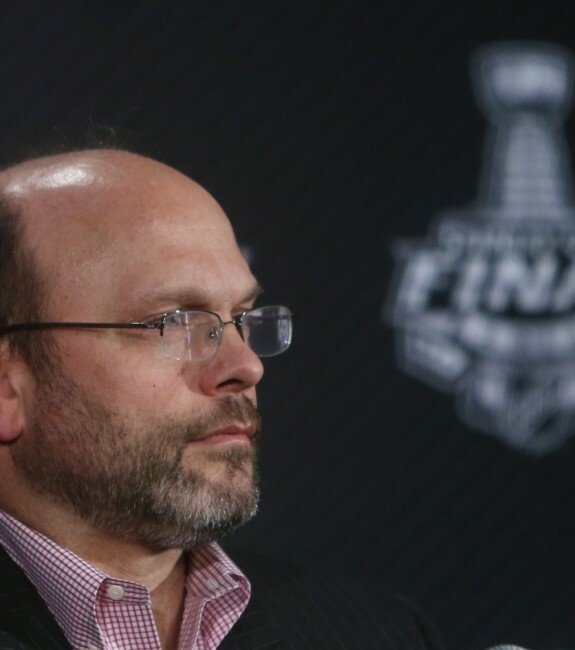 GM Peter Chiarelli is not afraid to make drastic moves to help this club. Coach Todd McLellan has winning experience. Although they’re staring at last, given who’s coming and who will go, there’s only one direction the Oilers can go. That’s up. Keep this in the back of your mind too. In McDavid’s rookie season with Erie, the Otters finished dead last. The next season, with new players coming and changes made, the Otters made the Western Conference Finals of the OHL. The real fun starts next season in Edmonton. For now though, another last place finish is in plain sight for the Oilers.